Honor is celebrating its second anniversary, and as part of the celebrations, is offering its latest flagship in India, the Honor 7, at a limited-period discount of Rs 1,200 along with exchange offers of up to Rs 12,000. The phone is available for Rs 21,799 on Flipkart, down from the earlier price tag of Rs 22,999. 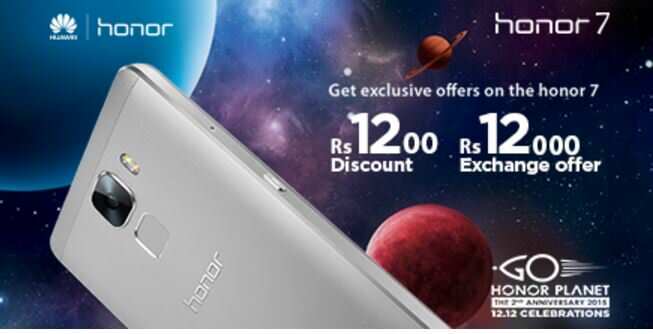 You can also exchange your old phone for an all-new Honor 7 and get up to Rs 12,000 off. Do note that the discount and exchange offer is available via Flipkart’s mobile app only. The Honor 7 (review) was launched in India in October this year. The brand offered the same exchange offer for the device of up to Rs 12,000 at launch time too. The phone comes with a metal body, and offers a 5.2-inch full HD display. The device is powered by a 64-bit octa-core HiSilicon Kirin 935 processor, aided by 3GB of RAM. The other specs include a 20MP rear camera with PDAF, an 8MP front snapper, EMUI 3.1 with Lollipop, 16GB memory (expandable), 4G LTE, a fingerprint sensor, an IR blaster, and a 3,100mAh battery with quick charging.